So you’ve heard of the doji, but what about the dragonfly and gravestone dojis? In this addition to my free price action course, my goal is to help you correctly identify and start trading the dragonfly doji and gravestone doji. These patterns are considered to be weak reversal signals (varying degrees of strength) or indecision signals. I don’t recommend pure candlestick trading with these signals, but they can be useful in addition to a profitable trading system that works well with candlestick signals. The dragonfly and gravestone dojis can also be used as entry triggers on their own, although this is not typically done. However, if that is what you would like to do, there is a higher-probability method for trading these signals on their own, which I will teach you in this article. What is a Dragonfly Doji or Gravestone Doji? In the image below, you will see a dragonfly doji and a gravestone doji. Starting with the dragonfly doji, it consists of a relatively long lower wick, no real body, and no upper wick. In the Forex market, a real body or upper wick that are only a few fractions of a pip is acceptable. The gravestone doji is the opposite of the dragonfly doji. It has a relatively long upper wick, no real body, and no lower wick. 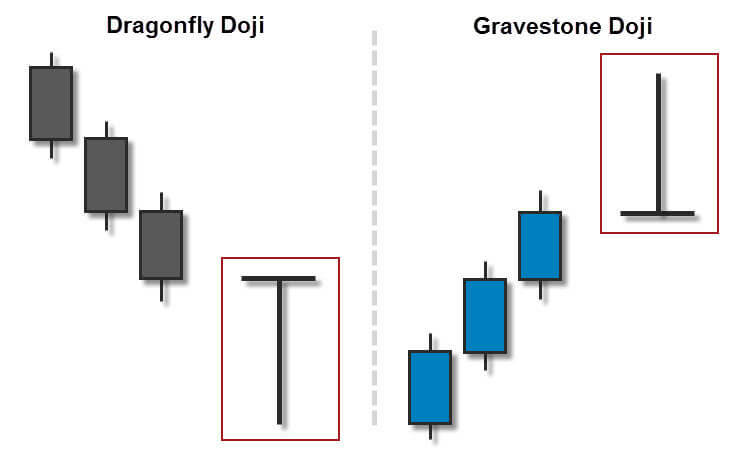 Similar to the dragonfly doji, a gravestone doji can have a very small real body or lower wick. Unlike many of the other candlestick signals that we have learned about, the dragonfly and gravestone dojis can have varying degrees of significance, depending on where they appear in the overall price action of the market. For instance, a dragonfly doji that appears after a downtrend (as shown above) is bullish. It would be similar to a hammer signal, but not nearly as strong. That same dragonfly doji, if it appears after an uptrend, becomes a slightly bearish or indecisive signal. In this case, it would be similar to a hanging man signal, but not as strong. Similarly, when a gravestone doji appears after an uptrend (as shown above), it is bearish. It would be like trading a shooting star signal, but not nearly as strong. However, if that same gravestone doji appears after a downtrend, it becomes slightly bullish or indecisive. In this case, it would be like trading an inverted hammer signal, only it’s not as strong. Both of these candlestick formations often appear in sideways or choppy markets as well. However, to be useful to our trading, we would only consider them after uptrends or downtrends. Never trade any candlestick signals during periods of consolidation/accumulation (sideways, choppy, low liquidity, etc…) in the market. In the image below, you can see a gravestone doji and a dragonfly doji that appeared in a choppy, (mostly) sideways period. These two candlestick signals only show indecision. They are not very useful to us because of the context in which they occur. Near the center of the image, you will see a long-tailed doji (or long-tailed spinning top). I do not consider this formation to be a dragonfly doji, because the upper wick is a bit too long. The long-tailed doji is, however, a bullish signal for a couple of reasons: 1, the long lower wick is bullish; and 2, the size of this candle is very large relative to any other candlestick in the image. Since it showed a rejection of lower price and was much larger than the other candlesticks in the area, I would consider this to be a pretty strong bullish indication – even though it occurred from sideways price action. Note: We’re not taking the long-tailed doji as an entry signal. Normally, we would never consider its significance at all, because it occurred in a sideways market. Its size is the trumping factor here. Also keep in mind that if a large candlestick occurs during periods of low liquidity in the market (such as the end of the New York session, or during the Asian session), the significance of the candlestick is nullified, because it’s much easier for fewer traders to move the market during such periods. Lastly, on the right side of the image above, you can see a dragonfly doji that appears after a small downtrend in price. 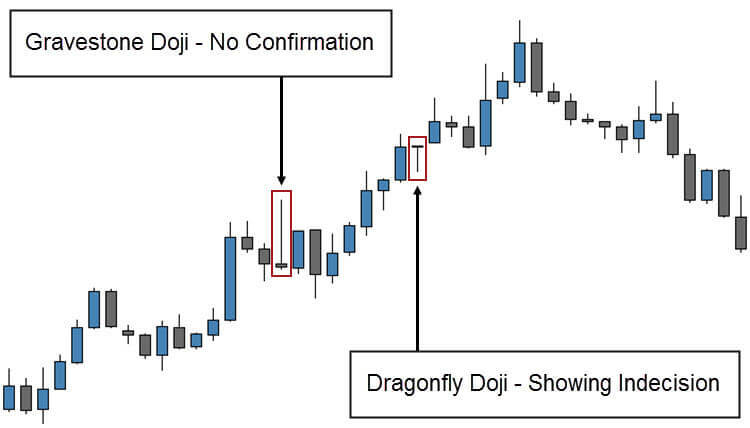 This occurrence of the dragonfly doji is actually useful to us. In this case, the dragonfly doji is a bullish signal. Combine that with the long-tailed doji from earlier on the chart and you could make a pretty good case for the market trending upward in the near future. 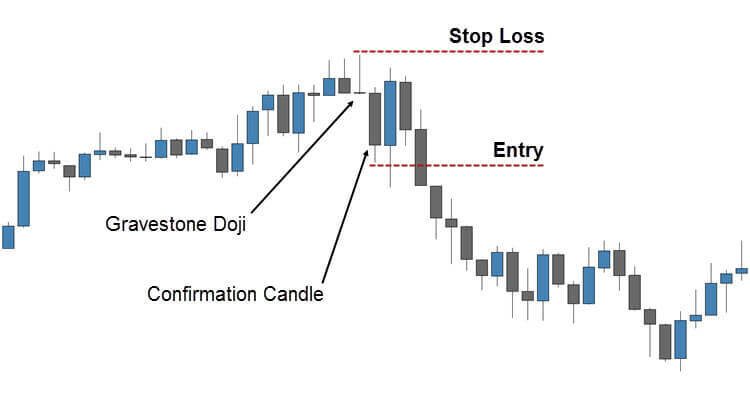 The image above is an example of how to take the gravestone doji as an entry trigger. As I mentioned earlier, I don’t recommend doing this, unless the trade is supported by a profitable trading method that works wells with candlestick trading; however, if you do want to trade these dojis as entry triggers, this is the way that I recommend doing it. Instead of jumping into the market right away, when the gravestone doji first appeared, you would wait for a bearish confirming candle. To be a bearish confirming candle, it needs to close below the previous candle. It should also close near the bottom of its total range. To put it another way, if the confirming candlestick in question has a long lower wick, that is not a bearish signal. I like the confirming candle to close in the bottom 1/3rd of its range for bearish confirmation (as in our example), or in the upper 1/3rd of its range for a bullish confirmation candle. In the example above, you can see a gravestone doji, followed by a bearish confirmation candle. In this case, the bearish confirmation candle occurred on the very next candlestick, which is good for reward to risk ratios. Your stop loss would have been placed 1 pip (plus the spread) above the high, which was our gravestone doji. The entry could have been taken at the open of the next candlestick after the bearish confirmation candlestick closed, if you wanted to be more aggressive and improve your chances of a good risk to reward ratio; or you could have taken the trade once price broke 1 pip below the low of the confirmation, as I’ve shown in the example above. 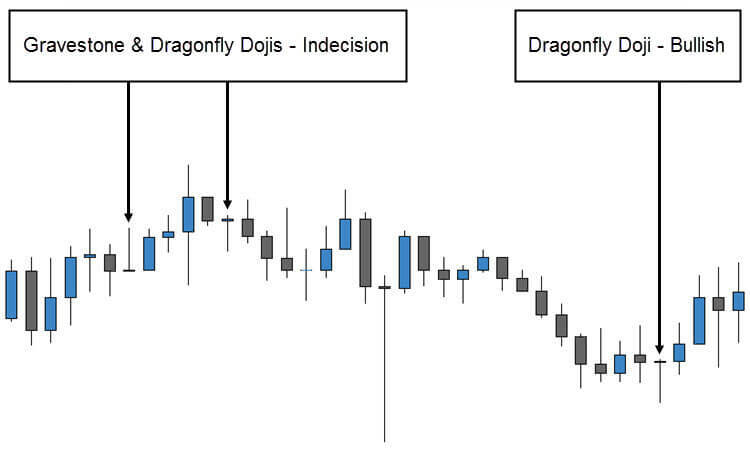 To trade the dragonfly doji as an entry trigger, you would go through the same steps, except you would wait for a dragonfly doji to appear after a downtrend, and you would wait for a bullish confirming candlestick. Also, the stop loss would be placed only 1 pip below the low of the downtrend (no need to account for spread). That’s because the spread is paid on entry during buy plays, and it’s paid on exit during sell trades. In the image above, you will see a failed gravestone doji setup, as well as a dragonfly doji showing indecision in the market (because it occurred after an uptrend). The dragonfly doji could be considered slightly bearish if it had been followed by a bearish confirming candle, but you would never use this as an entry trigger either way. Going back to the failed gravestone doji setup, you can see that it does meet the minimum requirements of a traditional gravestone doji. Although it does occur after an uptrend, it occurred after the uptrend had retraced slightly. In this context, it’s more of a sign of indecision than a bearish signal. Also, no bearish confirmation candle occurred to support the gravestone doji as an entry signal. There was a bearish candlestick (second candle after the gravestone doji). It did close below the low of the previous candlestick, and it even engulfed the real bodies of the previous two candlesticks; however, looking at its lower wick, you can see that it did not close within the lower 1/3rd of its range. This is a great example of an entry that you should skip. If you were already in a buy trade, this signal would not have been a good indication to exit your trade early either. The same goes for the dragonfly doji that appeared later in the trend, but just look at that beautiful bearish engulfing pattern at the very top of the uptrend. Japanese candlesticks are a great way to predict short-term trends and trend reversals; however, without a confluence of supporting market factors, it can be hard to predict which trends or reversals will continue with enough follow through to hit your take profits. Combining price action trading with a trading system that works well with candlestick trading signals, like the Infinite Prosperity system, is a great way to qualify these candlesticks trades. I do not recommend pure price action trading. Note: Check out my recent article about trading MACD divergence with price action signals, or learn how to trade divergence between price and other indicators. Never take any candlestick signals out of context. It is important that you understand where these candlestick signals are useful and where they are not. The dragonfly doji is only really useful to us when it appears after a downtrend, and the gravestone doji is only really useful to us when it appears after an uptrend. Other occurrences of these two candlestick just signal indecision. Trading the dragonfly doji and gravestone doji can be profitable, if you do it the right way. Most price action traders overlook these candlestick formations, because they are weak reversal signals. Under the right circumstances, though, they can be very useful as early exit signals or even entry triggers. As always, be sure to and demo trade these candlestick signals until you’re consistently profitable with them, and have fun trading!